The epic journey continues as I go onto another New Orleans Ice Cream Company review from the free shipment of pints that I received and that leads me to this review of the New Orleans Ice Cream Company Peach Melba Ice Cream. Something about the name of this pint hits close to home for me, but I can't quite put my finger on it. Okay, maybe I can, but I'll try to retain at least a shred of anonymity here. Enough screwing around...time to dive into the review. For nutritional purposes, this one is four half-cup servings and each serving is 220 calories. So, in terms of taste, I can't say that the ice cream itself had any peach flavor. All I tasted was vanilla and if there was any peach flavor, it was extremely mild. The peach chunks themselves were fairly hard to chew, although once you let them sit in your mouth for a bit to melt and then chewed them, they did have that wonderful peach flavoring that you would come to expect from a truly underrated fruit (in my opinion). Like I said, I didn't even remember there were almonds in here until I re-read that lid, so you can obviously guess how well they performed. Maybe I chewed through one when I thought I was eating a peach, but I honestly can't remember. That's how unremarkable they were. What really made this pint though was the raspberry swirl. 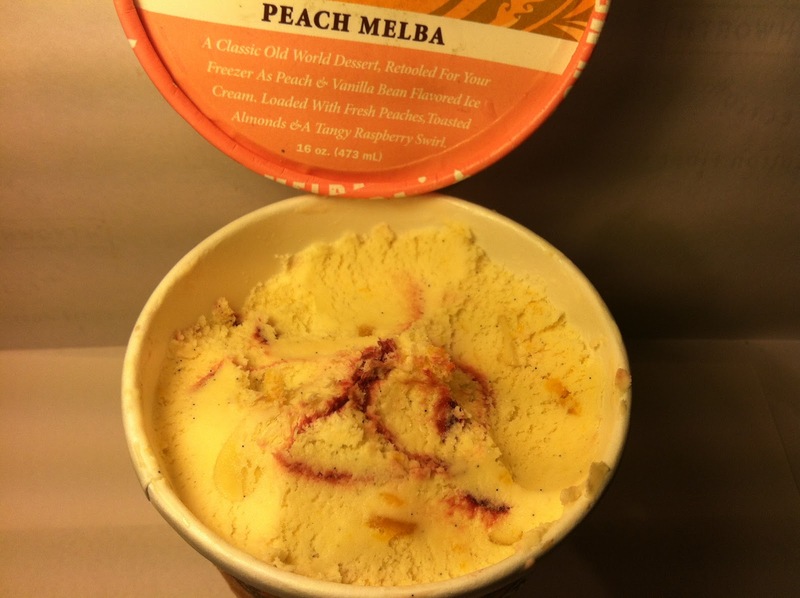 It brought an awesome tart sweetness to the rather flat sweetness of the peaches. 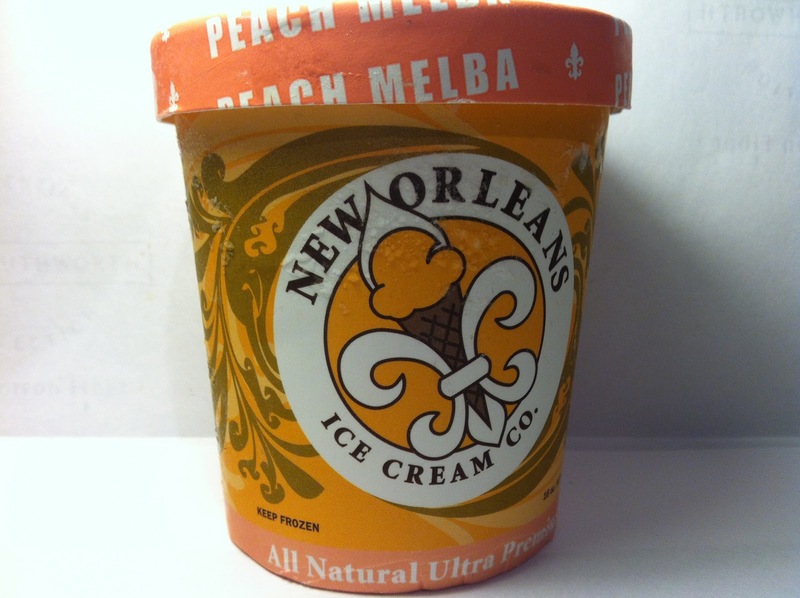 It also took the peach/vanilla ice cream up another notch as it brought more flavor to what was a tame product. In those spoonfuls that I did not have raspberry swirl included (which was rare), I was a disappointed man. In those spoonfuls that I did have raspberry swirl, this was a delightful pint of ice cream. Buy It or Fly By It? If you can make sure that you try to include a raspberry swirl in each spoonful, which is not difficult, you are definitely going to like this pint of ice cream. I know I did and that's why I give it a BUY IT rating. All in all, it's a mildly tasting and wholly pleasing treat and it's presence of the raspberry swirl that makes this classic dessert a winner. Now I just wish I had more of this semi-familiarly named treat readily on hand instead of having to order it online since it's not available in my local stores. Darn! Other reviews: The Ice Cream Informant and Option Pitch and Waffle Crisp.